If we want to calculate the Age in a number of years using Birthdate field (i.e. Date type field) in CRM we can achieve this in multiple ways. Here we tried to achieve this functionality using MS Flow. Below example is configured for contact entity and flow will trigger whenever the record is created in Contact Entity. Click on ‘Create from Blank’ button, to create new Flow. You will be redirected to below screen then click on ‘When a record is created’ option which is highlighted in below screenshot, to trigger Flow on create of Contact entity record. After this you need to select Organization Name and Entity Name once again. Here we need to select one more field i.e. Record Identifier to uniquely identify the record which needs to be updated. Find Age field in list then click on “Add dynamic content” then add mentioned expression as below under “Expression” tab then click OK. 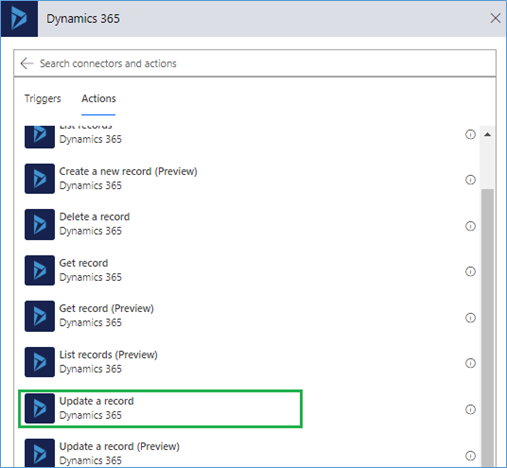 Using the simple steps given above user can calculate the Age in Dynamics 365 CRM as a number of years using Microsoft Flow.